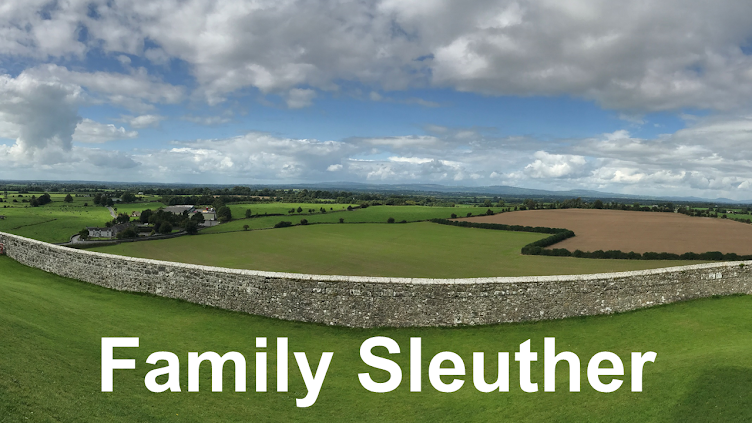 Lucinda Dornon, my fourth great-aunt, has been a remarkable character and the subject of a handful of this blog's attention-grabbing headlines. First, there was the hope that she, along with her siblings, could help me determine what happened to her father - my fourth great-grandfather Burr Zelah Dornon, whose death and disappearance from the record trail was sudden and shrouded in mystery during the height of the American Civil War. She suffered terrible tragedy. 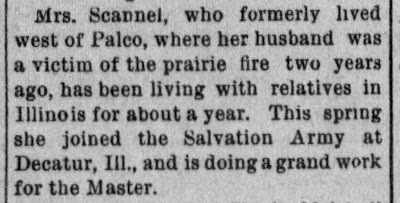 Her first husband, Sylvester Scannel, was killed in 1893 in a terrible prairie fire. Following her early widowhood, Lucinda married Levi Stanley in 1899, moved to Oklahoma, and then disappeared - like her father - from the records. A 1916 Oklahoma guardianship case for Lucinda's second husband Levi Stanley filed by "Committee of Friends Church Cherokee" told the court that he "lives alone, and is old and bed-fast, and has no one to care for him." There was no mention of Lucinda, which made me wonder if she pre-deceased Levi. Several newspaper clippings from 1904, shone a light on the mysterious Lucinda. The articles detailed Levi and Lucinda's trip from Oklahoma to visit her sisters in Plainville, Kansas. While in Plainville, a probate judge, jurors, and physician "examined and judged Mrs. Stanley insane." She was sent to an asylum in Topeka for treatment where she died within days of her arrival. Lucinda's asylum patient file unexpectedly held the key to determining the circumstances of her father's death. According to her admission form, her father died of dropsy at the age of 45 - apparently not a victim of the Civil War as I initially speculated. In late 2015, I wrote a blog featuring five unlabeled photographs that I was certain featured my family. However, without an inscription to identify the portraits' subjects, I was at a loss and they remained mysteries lost to time. Number five was a portrait of a woman in a Salvation Army uniform, with the typical 'S' on each lapel of her collar, meaning "Saved to Serve." The photograph was taken at East End Gallery in Decatur, Illinois. There was a strong resemblance - particularly in the eyes - to other identified Dornon sisters. Lucinda did live in Decatur for some time following the death of her husband Sylvester. However, her older sister Mary (Dornon) Vandegraft also lived in the state. Naturally, I wondered if the photograph was of Lucinda, but I had never heard any mention of membership in the Salvation Army. At least not until another Kansas newspaper was recently digitized. The Stockton Review and Rooks County Record was recently scanned and made available online. A search of the surname Scannel returned the following hit for June 28, 1895. 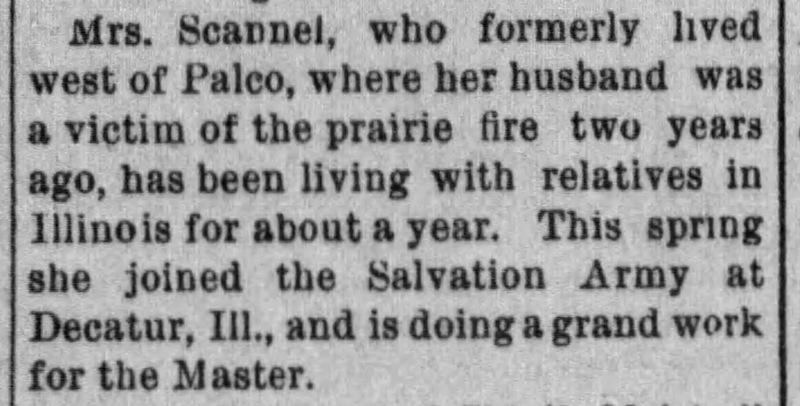 The newspaper confirmed that Lucinda was a member of the Salvation Army. 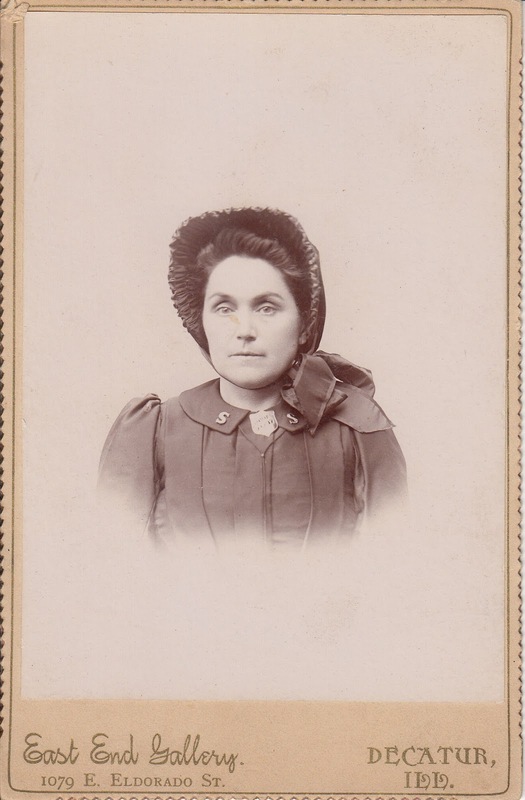 Although there's no name or signature to identity the pictured individual, the back of the photograph does have a handwritten note suggesting that it was sent from one sister to another. The name Ernest, written in another hand at the top of the photo, is of my second great-grandfather who owned the photo album. I believe it was added by another person, likely to indicate it belonged to his photograph collection. The note reads, "Sister dear let me know if you got this chromo all rite [sic.] or not. This is an answer to your letter. Write all the news and write soon. When I hear from A.C. I will send him one not like this. I have news for you when..." The note is obscured by a tear to the back of the photograph. Turning the photograph 90 degrees to the right, the writing continues, "The sooner you ably answer this the sooner you will get the news. 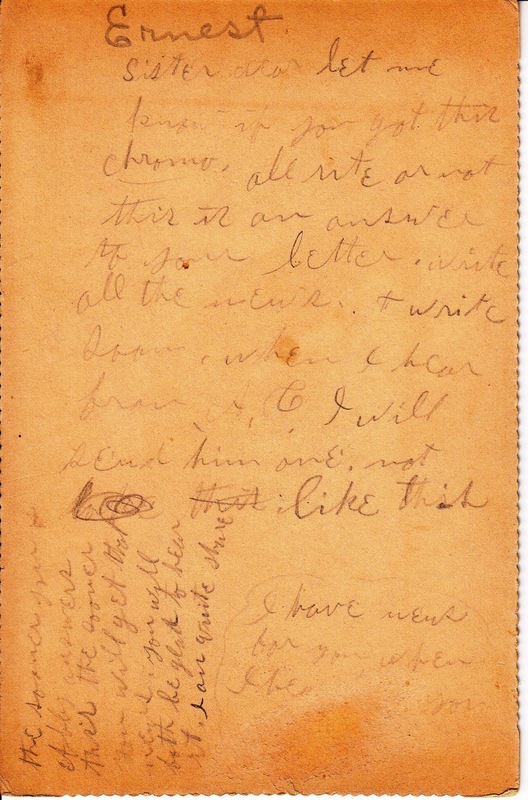 You will both be glad to hear it, I am quite shure [sic.]." The note, addressed "Sister dear" clearly links the pictured individual as a sibling to the recipient. Now would be a good time to note that the photo was in the collection of Ernest Benedick whose mother was Anna (Dornon) Benedick, Lucinda's sister. Based on the evidence in the photograph, the newspaper blurb, and the handwritten note, I believe the image is of Lucinda (Dornon) Scannel Stanley - a woman who suffered much in her life, but who did help answer the question of her father's mysterious death. There's no better feeling than identifying an unlabeled photograph with the help of a newly digitized newspaper! I'm glad to finally have a face to put with her storied name. It's a great feeling for sure! Great discovery! It must feel great to be able to identify that photograph. It's one of the best in my family history endeavors.